ThinkOut, our cash flow management platform, just got prettier and richer: new features, a more intuitive and interactive interface. You can check the new version here. If you aren’t already a user, you won’t tell the difference, but you’ll have an easy to use cash flow tool at your hand. Still, we can’t say it was launched. Not in the typical sense of the word. We just uploaded it and spread the word to those who may need such a tool. That’s our launch. We recently came across this article about how coming up with the new version of a product is not actually a launch. The timing was perfect because we were about to… yes, launch! the enhanced version of our ThinkOut platform. Only that we didn’t feel like we were launching anything, but making available more product features and a better experience for our present and future users. Once we read how Neel Bhat from TransparentCareer described how they saw their re-launch, it hit us: of course we don’t get frantic about it! We’re not launching a spaceship to Mars (‘cause launching to the Moon is already so passé)! We agree that any new product deserves a nice launch, it’s how it gets attention, but the sense falls more into the start or present meaning area. Even more so when it comes to an enhanced version of the product that is already available. It’s absurd to put in a launch more energy than needed every time you add something to the product. 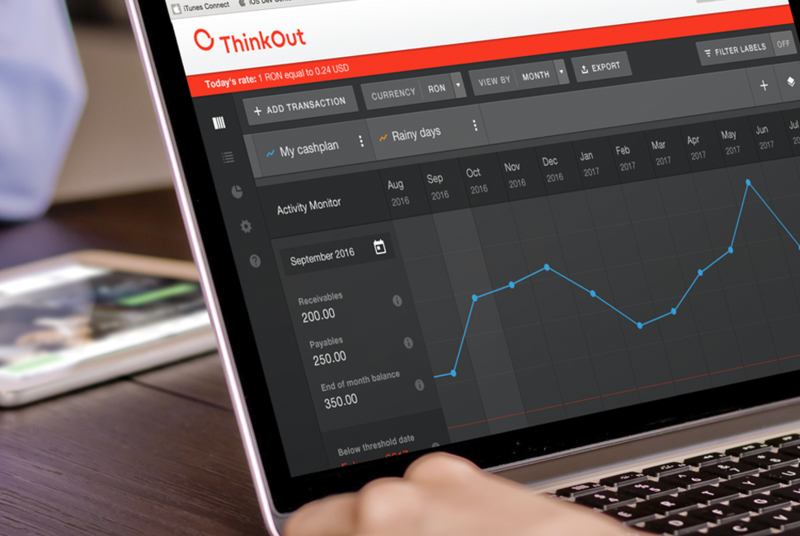 The ThinkOut interface is now more interactive. Various windows and info popups help the navigation through its functions, guiding you step by step in what needs to be done. Easily, clearly, stress-free. We applied colour differentiations to make it even more obvious which are the forecasted, realised or overdue values and to which group they belong: Income or Expenses. Now you can add more scenarios starting from the initial cash plan, just by hiding or adding transaction categories. Chances are that you have certain, constant transactions that form the base for the future hypothesis. With the Add Scenario feature, you can keep what you are sure of and add or remove variables in just a few clicks. More time to explore the possibilities for your business. We made it clear which transactions have been already handled and which ones are still assumptions. The default values are the forecasted ones, but once a transaction takes place, you change its status and its colour turns green for Income and yellow for Expenses. This way you’ll always know what is yet to be paid or cashed in and what is still “in waiting”. Also, if a transaction is overdue it will automatically turn red, so you can take action and avoid penalties or losses. In ThinkOut not only you can check the history of all changes made by you or other colleague invited to use the account, but also check a “To Do List” of transactions. This nice feature lets you know in an organised way what needs to be done. In Activity, you’ll see three lists of transactions: the overdue ones and the ones for the current and the upcoming periods of time. To make it easier to navigate and organise your transactions (income and payments), you can attribute labels to each value: the bank account, a project or client, a particular event and so on. This way you can easily track the cash movements corresponding to a certain activity or resource. It will help you see things clearer. This one is pretty clear: we added a list of the most used currencies and every time you enter a value and you want to convert it to a different currency, ThinkOut does the conversion automatically, at the daily exchange rate. The cash plan displays the values in the currency of your choice. If, for example, you cashed in an invoice in a foreign currency and you don’t want to do the math, just add the sum as it is and it gets converted to the chosen currency of the cash plan. Enough talk already. See it for yourself if it’s the useful, enjoyable tool we want it to be. You have one month for free to see how it works for you. Try it.